As a lifelong crocheter and a novice knitter, I am constantly buying yarns, hooks, needles, and pattern books. Unfortunately, I tend to either buy duplicate notions (I have the world’s largest collection of 3.5mm hooks), or not enough yarn to complete a project. Spinning a Yarn: Keeping tabs on the amount and types of yarn at your disposal is just one of the things that Knit Buddy tracks. 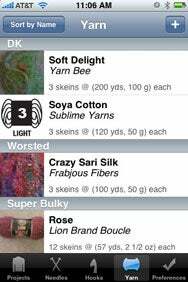 Knit Buddy by David Ross Software is a promising mobile solution for absentminded crafters like me. The $5 app helps crafters keep track of their yarn stashes, needles and hooks, and open projects in a fairly no-nonsense way. Adding yarn and needle details in Knit Buddy is simple, but still gives serious knitters the ability to enter important details like weight, dye lot, fiber and swatch gauge. The app supports multiple open projects, which, in turn, support multiple row counters—crucial to complex garment construction. While Knit Buddy excels at keeping track of yarn and needles, it needs some extra polish to make it an essential crafting tool. I admit I am biased toward crochet over knitting when I say the app’s hook options are limited, and swatch options for standard crochet stitches would be helpful. Still, since the app is called Knit Buddy, I think even indexing hooks exceeds expectations. However, knitters and crocheters alike could wish for more information per project—yarns and yardage required, pattern sources, hooks or needles needed to make gauge. Overall, Knit Buddy is off to a very good start and has proven to be quite handy on my trips to the yarn shop. Knit Buddy is compatible with any iPhone or iPod touch running the iPhone 2.x software update.